Remember that time when I had a blog? And I, like, wrote… posts? Sorry that I “went dark” there for a little while (“went dark”… can you tell that I’m in the same room as my husband while he watches reruns of 24 on Netflix?) We went on a trip to Colorado for a couple of weeks and I thought that I’d have time to write but alas, I did not. But if it makes you feel better… we were having a great time with family! Yesterday, I came across a post by Proverbs 31 Ministries on their facebook page that was a game changer for me. 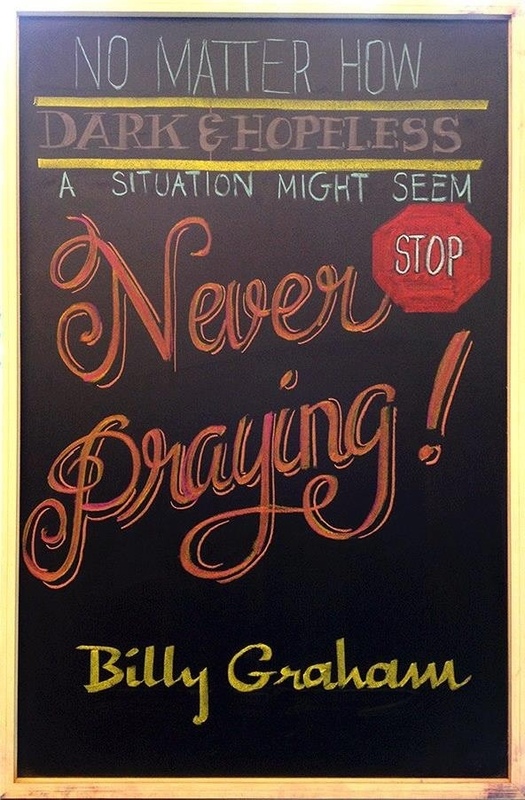 No secret that I’ve been struggling through the past few months… but when I saw this quote by Billy Graham today, it was like a light bulb went off in my mind. I mean, I talk about it, I type a prayer out on here every once in a while, but we are talking that this prayer thing needs to be CONSTANT. Hmmmmm, isn’t that, like, a verse or something? It helped me to have a time set aside for a quick prayer. A “twitter” prayer, if you will… 140 characters. Kept me from babbling and forced me to really focus in on what I wanted to REALLY say to Him. It was a neat exercise. So today, I’m not going to write out a little prayer. Because I need it to be more than just a “when writing a blog post” and “before dinner” prayer thing for me. I need to be communicating with God more often. I need to stop my day… no matter what is going on, and pray. I need… to never. stop. praying.